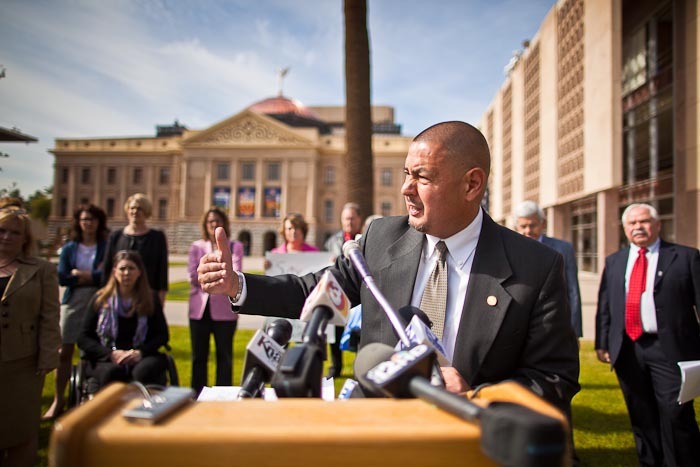 Arizona State Sen Steve Gallardo (D-Phoenix) talks about his opposition to allowing guns on Arizona's college campuses during a press conference at the State Capitol this afternoon. Americans love their guns and nowhere is that more evident than in Arizona. This state has some of the loosest gun laws in the country, including very permissive concealed carry laws and no laws at all against "open" carry. It's not unusual to see people carrying guns at public functions around town. A couple of years ago, I photographed a man carrying an AR-15 knock off at a Tea Party rally against President Obama. While President Obama was talking to veterans in the building next to the rally. After the nation was shocked by a mass shooting in Tucson, where 18 people, including Congresswoman Gabrielle Giffords, were shot and six of those people killed, our legislature responded by naming the Colt Single Action Army .45 the state's official handgun. Last year, after the Giffords shooting, during the same legislative session that named the SAA our state handgun, legislators passed a bill allowing people to carry guns on college campuses, including in classrooms. Although there is no statistical evidence to support their view, Republicans said the bill might prevent Virginia Tech like mass shootings. In a rare show of Republican disharmony, Gov. Jan Brewer vetoed the bill. That was then and this is now. The State Senate Republicans brought the guns on campus bill back this year. Predictably, the Democrats oppose the bill. But it's also opposed by police (including campus police), parents of university students, university administrators, university students and victims of gun violence. All of whom lined up to speak against the bill at this afternoon's press conference and during the Senate Judiciary Committee hearing on the bill. Predictably, the Republicans support the bill. Even though they claim to be in favor of law and order and support law enforcement, in this matter they evidently know better and brushed aside police concerns that the bill could lead to incidents of "friendly fire" and accidental shootings (because just as there is no statistical evidence to support claims that more guns will make colleges safer, there is no statistical evidence to support the claim that more guns will make colleges more dangerous). After a couple of hours of discussion, the Senate Judiciary Committee voted 5-3 to allow guns on campus. Now the bill goes to the full Senate where it will likely pass. There are more photos from the hearing in my archive and available from ZUMA Press.